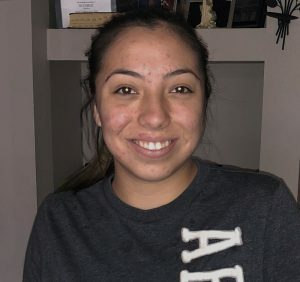 PHOENIX – Saray Escobar Gomez dreams of becoming a teacher and is just three courses shy of completing her associate’s degree at Paradise Valley Community College. However, as a DACA recipient, Gomez said it will take her longer to complete that degree after the Arizona Supreme Court’s April 2018 ruling that DACA recipients – who also are known as Dreamers – are ineligible for in-state tuition, leaving many of them with few options and resources for the school year. She attends one of the Maricopa Community Colleges, where tuition for the school year is $326 per credit hour for non-residents compared with $85 per credit for Maricopa County residents. “My mother … and I join what we earn together, and that’s how we make it,” Gomez said, referring to getting financial support from her mom to finish her degree. DACA – the Deferred Action for Childhood Arrivals program – is a Barack Obama-era policy that protects from deportation young immigrants who were brought to this country as children. It was implemented in 2012 after Congress failed to pass the Development, Relief and Education for Alien Minors (DREAM) Act. Last month, a federal judge in Texas rejected part of a lawsuit from that state and eight others seeking an injunction to stop DACA. Pro-immigration activists applauded the decision allowing Dreamers to continue applying for this program, which also provides them with a two-year work permit. According to the most recent data from the U.S. Citizenship and Immigration Services, more than 26,200 active DACA recipients live in Arizona. Gomez is one of them and said she won’t allow her immigration status, currently in limbo, to prevent her from acquiring her dreams. “I think I’ll do it. I believe in myself, and my family believes in me, too,” Gomez said about finishing her studies. Other students in the same boat are weighing their options, including going to trade school to learn to be a technician, mechanic or a similar career. Isabel Pimentel said she has been entertaining the idea of becoming a real estate agent. But the main problem boils down to money for these Dreamers. Pimentel said she relies on her job at an Amazon Fulfillment Center to raise money for college. “I’ve been trying to stay at Amazon for as long as I can because after a year of being with them, they will pay for school,” she said. DACA students cannot receive federal student aid, commonly known as the Free Application for Federal Student Aid, or FAFSA, but they can get private scholarships. Tuition reimbursement through an employer is another way for Dreamers to pay for college, but companies have different policies that require employees to work a certain amount of hours and study in certain areas to receive the full benefits. 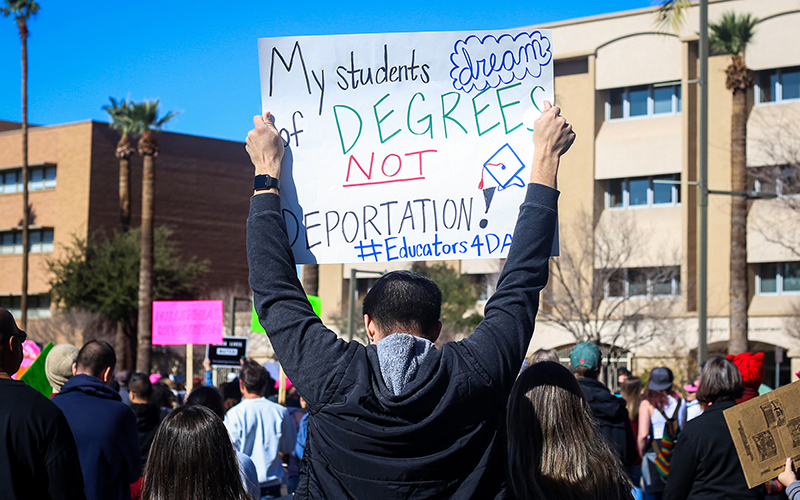 Karina Ruiz, executive director for the Arizona Dream Act Coalition, said despite the challenges, DACA recipients shouldn’t abandon their studies, and she suggested they consider out-of-state college options. There are 274 DACA students enrolled for the fall 2018 semester at Arizona State University, an increase from 259 from the same time period in 2017. ASU offers more resources through DREAMzone, an organization providing support for undocumented and DACA students. For now, Gomez said she will continue to pursue her college education despite the court’s ruling, no matter how long it takes.